Gabrielle demonstrates how to make a good impression with the tools. The Midwest chapter of the GBW kicked off the year with a workshop given by Gabrielle Fox on An Introduction to Surface Decoration. We were generously hosted by the King Press at the University of Kentucky in Lexington. We began in the afternoon, and in order to learn everything Gabrielle had planned for us, we started right away. Gabrielle demonstrated hot foil stamping on a Kwikprint and had us trying our hands at it on binder’s board, paper, cloth, and leather. Excited by this instantly gratifying technique, Gabrielle demonstrated hand tooling with an assortment of lovely ornaments and lines. For a beginner, hand tooling is an intimidating skill to learn, so it was wonderful to have a patient and gentle instructor helping us through the scary first steps and encouraging us to experiment. Needless to say, everyone eagerly jumped in. We discussed planning designs and most importantly what it takes to make a good impression. We then learned how to paint in the glare for the gold leaf that would come later. After a while, Jim Birchfield, the curator of books for Special Collections & Archives at the University of Kentucky’s Margaret I. King Library, treated us to see fine examples of surface decoration from the library. From incunabula to modern bindings, we saw examples of beautiful surface decoration methods on a range of leather and vellum bindings. Jim was able to tell us much about each book and their individual histories which were as interesting as the decorative techniques on their covers. We were extremely lucky and grateful for the opportunity to handle these books. 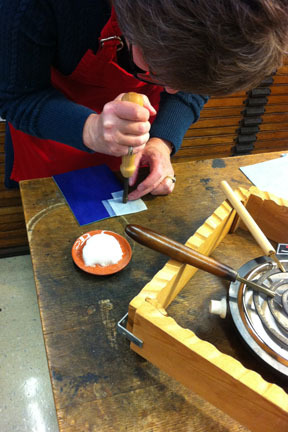 Inspired, and a little humbled, by what was seen we finished our afternoon with a demonstration of surface gilding. We left thinking of ways we could use what we have learned and eager to start again the next day. Gabrielle and a few members met for dinner that evening and had a chance to catch up with one another. Gabrielle shows the participants how to handle the delicate gold leaf. 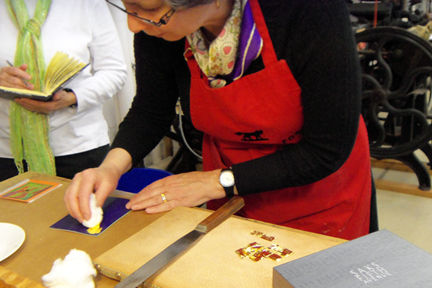 Sunday morning, Gabrielle helped us continue the surface gilding process with gold foil transfers. Soon after, we moved to the exciting yet intimidating application of gold foil, a material that flies around the room on the lightest breath lending some surface decoration to the surrounding work space. We were shown how to cut the foil and move it into place by the end of a cotton ball. Then, we pursued the formidable task of trying to fit our tools back into the blind impression and have the gold stay after the excess was brushed away. Once successful we were excited with the result. We continued to practice the techniques we learned on each of the covering materials and only stopped for Gabrielle’s demonstration of onlays, back paring and inlays. She also discussed with us how to attach various objects and heavy materials to covers. Afterwards, we looked at some of Gabrielle’s wonderful books where she employed the techniques we had learned about that weekend. With the few minutes left over, we gave some of the techniques a few more tries. We ended the workshop feeling mentally exhausted but eager to try these techniques on our own. Gabrielle was a generous and patient instructor with a knack for breaking down inhibitions and inspiring ideas for future projects. 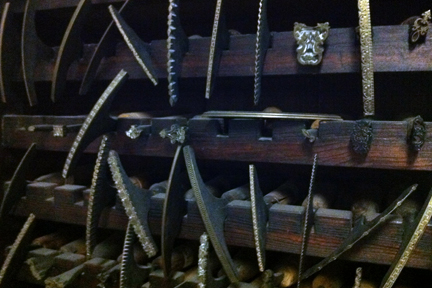 A selection of hand tools at the King Press in Lexington. This entry was posted in Reviews by midwestgbw. Bookmark the permalink. Gabrielle taught the very first bookbinding workshop I ever attended back in 1989. I can only imagine how her skills and technique have improved since then – both as a binder and teacher.